Well, a guy called Rafael in Brazil has come up with a guitar solo to fill that space. In Utah on Tuesday night, Poison bassist Bobby Dall got sick about 20 minutes before they were due to hit the stage in their gig with Def Leppard and Cheap Trick. Our very own Hugh McDonald happened to be there and took his place and even did backing vocals for "Unskinny Bop". Not only did three of the biggest names in rock play on the same stage before several thousand fans at the USANA Amphitheatre, but when one of the bands needed an emergency substitute, who should just happen to be hanging out backstage but Bon Jovi's bass player Hugh McDonald. McDonald stepped up to the plate just 20 minutes before Poison was scheduled to go on stage when bassist and part-time Utah resident Bobby Dall became too ill to perform. Rather than cancel their set, singer Bret Michaels said McDonald volunteered his services and took a crash course in learning several Poison songs. The band was a little late getting on stage, and Michaels himself seemed to be fighting something as his voice wasn't as strong as it has been in previous Utah shows. But Poison and McDonald deserve full props for their show-must-go-on attitude. A trailer for When We Were Beautiful, previously 25 Years in Black and White. It's on Youtube but has been blocked in several countries so here's another link. Looks exciting for us Bon Jovi fans, but I bet there's like one second of Hugh McDonald in the whole thing (which probably won't bother most of you but I've gained a bit of notoriety for my Hugh campaigns :P ). EDIT: The above link has also been deleted. Evidently, even in this internet age, the powers that be have yet to figure out that having things like this available actually increases interest among fans and the public, and hence increases profit for them. Try Hath or Big Apple Jovi. Someone whom I was initially surprised to find has his own entry in the Bon Jovi Encyclopaedia is Aussie singer-songwriter Shannon Noll. He has worked with Richie Sambora and Luke Ebbin and I've blogged about him before. I actually met Shannon and his bassist Matty Cornell in Perth on Friday, and attended Shannon's unplugged gig "In the Raw: In Conversation and Acoustic" at the Burswood Theatre that night. He had a bit of a cold but it was still a wonderfully intimate evening, and audience members got to ask him questions in between the two sets that were played. Among other things, including a marriage proposal, Shannon was asked about his writing trip to the US a couple of years ago, which of course spawned "Sorry Is Just Too Late", co-written with Richie. Shannon said in America he could sort of escape the prejudice that came with being an Australian Idol product and be judged on his voice, music and work ethic. He also mentioned freaking out because Luke Ebbin apparently sent an e-mail to Jon Bon Jovi to say that he was producing the album of an Australian musician who was one of the best guys he'd worked with... Shannon's reaction was "What?! You can't send that, it's JON BON JOVI!" Hah. Anyway, I thought I may as well share a sweet little video from the Perth gig of "Now I Run" which was written about Shannon's late father and dedicated to a young fan in the audience who had just lost her dad. (Please excuse the Elvis impersonation at the start of the vid :P ). 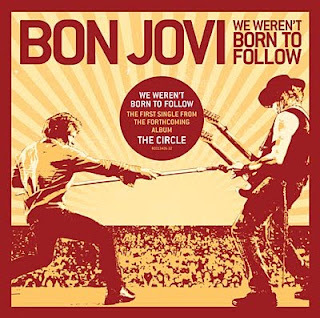 Here's a rip of the first radio play of Bon Jovi's newest single "We Weren't Born to Follow" on Mix 96.9 in the US! EDIT: I realised that whenever I click on any of the uploads on Youtube of this song I get the message: This video is not available in your country due to copyright restrictions. This wasn't happening earlier in the day but I guess the censors have got on their bikes now... E-mail me if you can't access the song. ADDENDUM: My thoughts? It's basically a typical Bon Jovi song. A typical Bon Jovi 00s lead single. Catchy, melodic, "It's My Life, Part 4" if I can be so crude, but it's got enough hook in it to be my flavour of the month so I'm enjoying it. That said, I do hope this was the lead single because it's catchy or because of the success of "It's My Life" and "Have a Nice Day" -- and not because it's the best song on the record. Hopefully the rest of the album is a lot stronger in substance. The new album is called The Circle and will be released on November 10. The lead single is called "We Weren't Born to Follow" and will hit radio next week (in the US I'm assuming). The album is "BIG guitars and BIG drums". EDIT: Obie has now added that tour info should be announced in two weeks' time and info about new BJTV episodes in September. Guitar legend Les Paul has died at the age of 94. In memory of the great innovator, here is a re-post of Richie Sambora performing "Great Hall of Fame" as last year's tribute concert. The Goddess Hathor has posted a charming interview with Richie from that time on her blog. If you've got Jon Bon Jovi's 1997 solo album Destination Anywhere, you'll be familiar with a song called "August 7, 4:15". This haunting track is dedicated to Katherine Korzilius, the six-year-old daughter of Bon Jovi manager Paul Korzilius. On August 7, 1996, Katherine went to collect the mail at 4:15pm and never returned. Her mother drove out to search for her and found Katherine's bruised and cut body laying on the road. Katherine was admitted to hospital with a fractured skull and pronounced brain-dead at 11:30pm. She had apparently been abducted, struck in the head, and then either jumped or thrown from a vehicle. Today marks the 13th anniversary of Katherine's death. The case has never been solved. The flames are all around you, how you gonna sleep again? The video below includes Jon's complete performance of new song "Working Man" from the National Conference on Volunteering and Service earlier this year. Get their hands in the dirt, who's gonna work off the curse? What is your most embarrassing experience? Some years ago I went to a pub in Primrose Hill in London to meet friends, and Jon Bon Jovi was sitting at a table. I recognised him and assumed I knew him from somewhere but didn't realise who he actually was. So I walked up to him, gave him a big kiss and said, 'It's so nice to see you again, how are you?' We had a long chat, and then I walked over to join my friends. They were all staring at me in awe and asked, 'How do you know Jon Bon Jovi?' I said, 'I don't', and then I realised what I had done. I was just cringing inside.